So I think I have a fingernail fungus. At least, that’s all I can discern from vague descriptions on the internet and horrific pictures of worst-case-scenario pictures of nail infections. I haven’t been around anyone with nail fungi. I haven’t done much out of the ordinary lately. I do know that my nails were free and clear of any infection before I applied my latest (new) nail polish acquisition. When I removed the polish, I noticed that the area where the quick meets the distal end of my nails (the part that’s free of the nail bed) on every nail was darker and tender, like there was pressure built up. My ring fingers and pinkies have white spots in the nail beds near the edges. 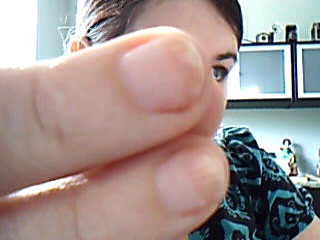 The white spots appear to run horizontally, but bleed up and down with the ridges in my nails. I’m not going to the doctor unless it gets any worse, because the internet is telling me that the antifungal medications are liver-damaging and that my infection might be treated better homeopathically and with creams. Should I start throwing accusations about this “new” polish? Is this just an allergic reaction? Totally unrelated? If one of you has a solid diagnosis, I’m all ears.